I have owned the speakers now for a couple of years and have not been super happy with the sound. After doing a bit of research on the speaker connections available for bi-wiring, it seems that perhaps the top connection designed for the high end (tweeter) isn’t working. If I connect my speakers via the bottom two receptacles they work with it without the jumpers. If I connect the speakers via the top two receptacles with or without the jumpers, I don’t get any sound. When the speakers are hooked up on the bottom two receptacles with or without the jumpers, I do get sound however there is virtually no high end whatsoever. Am I doing something wrong or are the speakers faulty? What would you recommend? Both speakers do the same thing? If so, sounds like tweeters are blown or something in each speakers crossover is fried. Have you played them unusually loud many times, and so on? I’m the original owner and they have been like that since day one. I purchased them online at Newegg. They have been paired with Polk bookshelf speakers which has masked the issue with the high end. It’s frustrates me but I figured it was something I was doing wrong. After digging into it the past two days I don’t think the issue is on my end at all. Obviously, the tweeters are not working. The tweeters may be fried, the high frequency circuit in the crossovers may be cooked or there may be a loose wire connection. You will need to open them up and start digging around or take them to a repair shop. I figured I’ll start with contacting Polk to have the tweeters replaced. If that doesn’t work, I will take it to a repair shop. Thanks for your help. Remove he tweeters and connect them directly to your amp/receiver, at low volume, to narrow down the issue. If you get sound, it's the crossovers. Okay, so newbie question. I’ve removed the tweeter from the speaker enclosure however how do you hook direct to amp? Pull the fast-ons off the speaker tabs, then connect receiver to the tabs. Make sure to note which wire goes to which terminal in case they are not sized differently. Thanks everybody for your help. What I’ve determined is I have one bad tweeter and two bad crossovers. 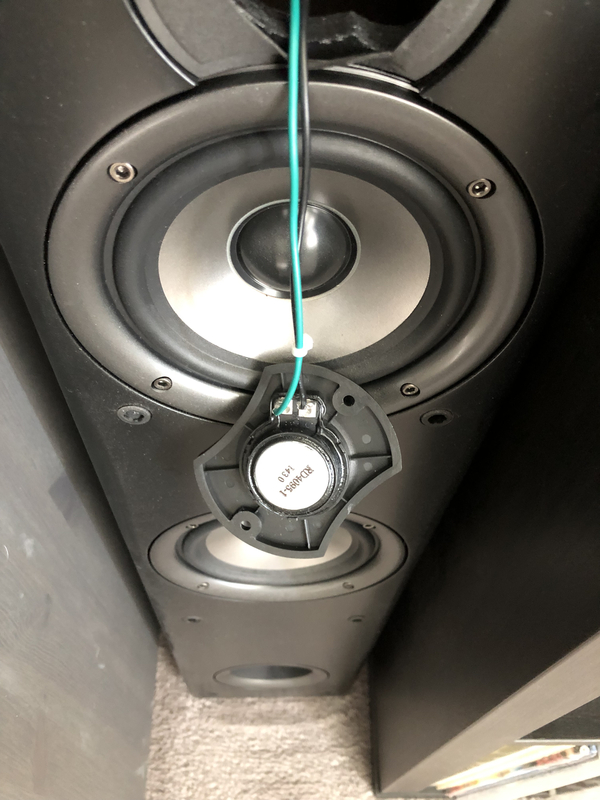 I say that because I was able to get sound out of one of the two tweeters and I hooked the good tweeter to the second speaker and was unable to get any sound from it through that speaker. I’ve put in a replacement request with Polk and hopefully will get replacement parts to perform the repair.